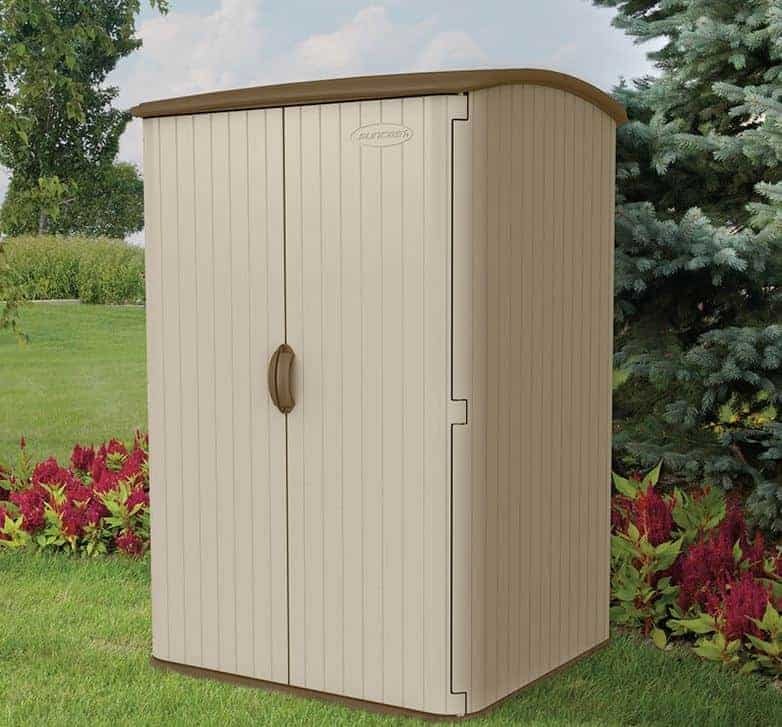 This tough plastic resin shed has a very original look to it, yet it also has many features that make it an ideal addition to a small to medium sized garden. 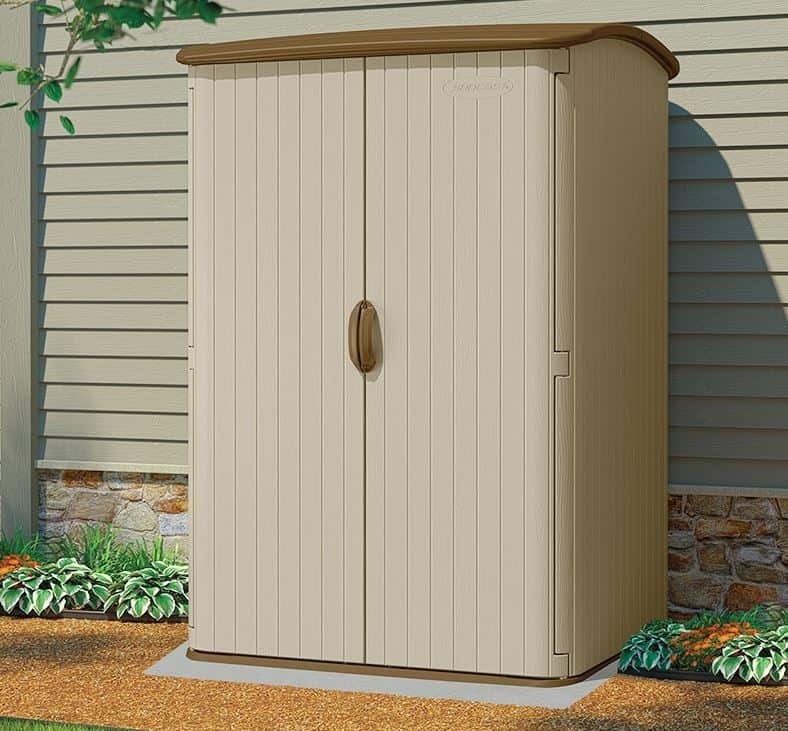 Although it has a relatively compact footprint it’s also very tall, which means that it’s perfect for the storage of taller garden tools and equipment. The walls are also grooved so that they can easily accept shelving, although the shelves themselves will have to be purchased separately. The structure as a whole is made from blow moulded resin which means that it’s both thick and very tough. It also has excellent waterproof qualities, and this is helped by the arched roof which ensures that rainwater simply rolls away. 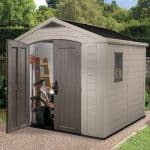 This ensures that the contents of the shed will remain dry and it’s also one of the reasons that the manufacturer has provided the extra reassurance of a five year warranty. We often see plastic sheds that have no floor, meaning that the concrete base itself has to act as the floor. It was good to see that a solid resin floor has been provided on this occasion, and as it’s reinforced it means that even heavy tools or machinery can be stored inside without any problems. Whilst we’ve reviewed lots of garden sheds made from PVC, this is one of the few we’ve seen that is constructed almost entirely of blow moulded resin. This has several advantages, notably that it’s easy to assemble and that it’s very sturdy and durable whilst still being relatively lightweight. This is also a shed that looks unlike any that we see from other manufacturers. The cladding itself is stone coloured but with chocolate brown contrasts on the handles and the roof, and the woodgrain effect creates a look that’s a mixture of the traditional and the modern. The roof itself is neither apex nor pent, but rather bowed so that rainwater instantly runs away rather than being able to sit on the surface. The roof also adds a little extra height to what is already one of the tallest plastic sheds that we’ve seen as the eaves height is a very accommodating 2.03m. The overall width of the base is 1.42m and the overall depth is 1.24 so this is suited to areas where the available space is limited. We were very pleased to find that blow moulded twin wall plastic resin had been used for the walls and the roof, as this creates a substrate that’s much thicker than that we usually see on plastic sheds. In fact, the cladding here is 38mm thick and the effect of this is very noticeable when assembly is complete. It’s a very sturdy structure that feels strong and reliable. The floor is also made of plastic resin, and as it has been reinforced it’s more than suitable for anything that could be stored in a shed of this size. We welcomed its inclusion, as opposed to the cold concrete bases that so many plastic sheds have. Being made of resin there is no chance that the cladding will rot or rust, and it’s also UV resistant meaning that it will keep its vibrancy and won’t fade over time. All of this means that there is no requirement for the owner to apply any treatments, and other than hosing it down from time to time it’s virtually maintenance free. This also means that it should have a long warranty attached to it, but whilst we appreciate that the 5 year warranty provided on this occasion is longer than some, we do feel that it could have been even longer given how tough the substrate is. We were glad to see that the double moulded doors take up nearly the full width and height of the shed, opening to 1.21m and 1.88m respectively, as this means that objects and tools of any shape and size can easily be stowed away and then retrieved. It was also good to see that the handles are designed to be ‘easy grip’, which means that they’re easy to use in rainy conditions when the operator’s hands may be wet. There are no windows included but with such large doors used on a relatively shallow building we found that the interior becomes well illuminated when the doors are opened. One security feature is the lack of windows that we just mentioned, as shed thieves are primarily opportunistic and are therefore less likely to break into a garden building if they don’t know what’s kept inside. To add an extra element of security, and one that will act as a visual deterrent too, we would have liked to see a padlock included but although the handles are holed and ready to receive one, no such padlock is included as standard. 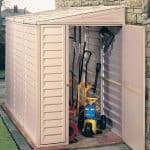 As shed security is an increasingly important concern, we would advise the purchase of a padlock and maybe even an alarm system as a priority when buying this shed. Unfortunately they will have to be sourced by the customer and bought separately as there are no extras available to buy directly with the building itself. We also feel that the addition of suitable shelving would be very useful, and these should be able to be picked up from any DIY store. 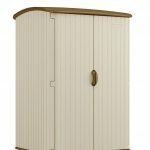 The thick blow moulded resin is at the cutting edge of shed technology, and shows a real attention to quality. This should prove to be a very durable and weather resistant substrate, although we would have liked the warranty period supplied by Suncast to reflect this more. 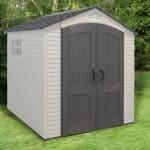 The base area itself is quite limited for a shed of this price, so we were glad to see that it was compensated for in part by a taller than average height. 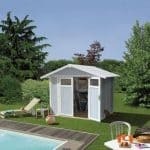 This is an easy to assemble garden building, as long as the instructions are read and followed carefully, so with a friend’s help you should allow around four hours for the process. 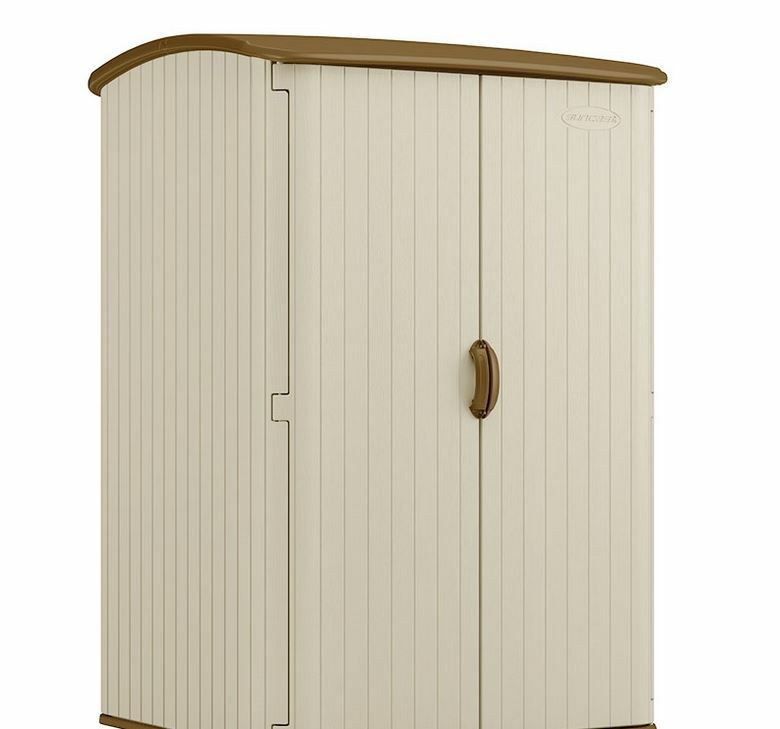 Quality of this kind does come at a price, but we have seen much larger sheds available for a similar or lower cost. 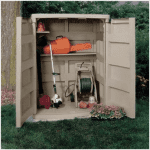 Final Thoughts: If you’re looking for a large and practical storage facility, yet don’t want to take up too much room in your garden, then this could be a perfect choice. There’s lots of vertical storage space available, and so it was good to see that the shed’s interior was grooved, making it easy to fit suitably sized shelves. 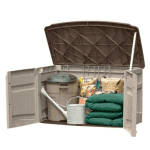 Doing so means that lots of smaller sized items can be stored alongside even the tallest garden implements and with the addition of a padlock they’ll be secure as well thanks to the no-window design. This shed has a look all of its own, but we found it attractive in a contemporary way.